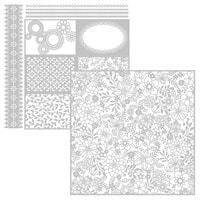 Posts categorized "Kits for Busy Crafters"
Anyone who crafts much at all knows that having the right adhesive for the job is key to producing beautiful projects that not only go together easily, but also stay together even when handled and mailed. One "size" of adhesive definitely does not fit all! I've put together a package deal of my favorite, can't-live-without adhesives, in a personalized, hard-sided slim case that is just perfect for taking along to stamping events, classes and crops. You'll also be getting a BONUS limited-edition, engraved Bone Folder Tool in every kit! Travel in style AND have exactly what you need, every time! PLUS, you'll never lose your adhesive OR mix it up, because it has your name right on the case! BONUS GIFT: Song of My Heart Stampers Engraved Bone Folder Tool totally FREE!!! This is a value of more than $45 plus shipping! And you'll get all that for just $37, which includes shipping anywhere in the United States. No, I'm not kidding! Get the Adhesive Travel Kit, the case, the personalized cover, the free Bone Folder Tool AND shipping all for just $37. Paypal Me Here and be sure to put Adhesive Travel Kit in the subject line and tell me what name you'd like on the cover(s). Your kit(s) will arrive in 7-10 days! You can use this PayPal link safely with any credit card, even if you do not have a PayPal account. Got questions? Email me at Lyssa@songofmyheartstampers.com! Offer ends April 30th, 2018. Order your limited-edition personalized Adhesive Travel Kit today! You'll love having the right adhesives for the job, and you'll feel SO professional as you craft with exactly the tools you need to be successful, every time. 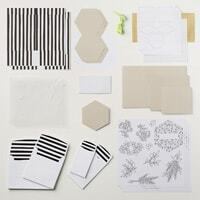 Perennial Birthday Card Box keeps you organized and on time! 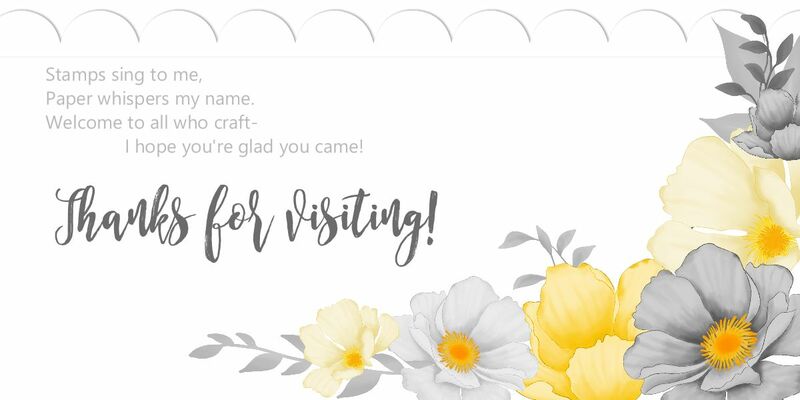 Time for a little Stampin' Up Product review! I know, I know, I'm not supposed to play with my new Spring Occasions 2018 Catalog demo-only pre-order stuff until I'm done with these last 40 Christmas cards!!! But when I saw this kit in the upcoming offering I had to have it... and had to put it together right away. Isn't it gorgeous? And so easy to stamp and assemble. In about an hour and a half or so, I had the card box all set up and 16 beautiful cards ready to go. I'm keeping this one for myself, but what a great gift it would make, eh? Either made up already or left as a kit, I can think of all kinds of friends and relatives who would love this set. The set-up is so handy. Each divider card in the box gets labeled with a month, and has a line for every day of that month. You add your friends and family's birthdates to the cards, and then when you get their card finished, tuck it in under that category. 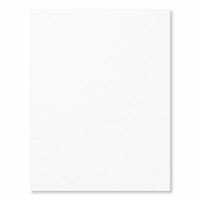 You can see at a glance who you still need to make cards for--and there's plenty of room to tuck the envelopes and sticky sheets of postage stamps or address labels inside, too. The box itself is super study and glossy-coated to wipe clean, with heavy-weight divider cards and a sturdy elastic loop and metal button clasp. I was impressed with the little instruction booklet, too. Large, full-color photos of the finished cards with easy tips on assembly, a complete supply list (stamp set, Dapper Denim, Flirty Flamingo and Old Olive inks, a pair of scissors and adhesive) and detail photos of the few tricky parts help make assembly a snap. The Perennial Birthday Box Kit coordinates with the sayings and flower images in the new Perennial Birthday stamp set, or you can use any stamps you have on hand to finish off the cards. Everything is die-cut and ready to stamp, pop out, and adhere. 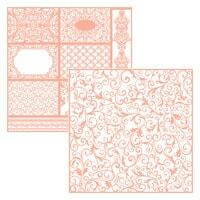 The pink card below is my favorite... great layout! I'll be using that on other projects, too. PS... if you're in my local Calendar Club on the 3rd Mondays of the month... we're making this entire project! I couldn't resist getting you all this adorable box and kit. See you January 15th for the first meeting of 2018! Watercolor Christmas kit makes 20 holiday cards in no time flat! Want to make your own Christmas cards but feeling short on time, or stumped for ideas? 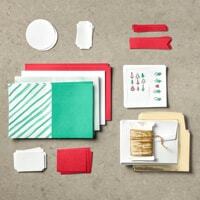 We have an awesome new kit that makes 20 holiday cards for just $20. Use the suggested stamp set or improvise one you already own! I am having fun using the card bases, trim and pre-watercolored elements and making the cards my own. This photo shows the four card designs you can make if you follow their instructions closely. I learned two new ways to use sequin trim from this project! The Watercolor Christmas card kit even comes with envelopes and gold foil envelope liners--such an elegant touch. Never one to follow the leader, I started mixing things up and adding bits and pieces of ribbon, swapping base colors, running things through an embossing folder, switching out the stamps. Fun! If you want to give yourself a break this year but still get handmade cards done, this kit could be the answer. Inexpensive, fast, with just enough space for personality without overwhelming you with too many decisions. It feels great to have so many cards done this early in the season! Maybe I will actually get them out on time this year. Hey--it could happen! They're back! Scrapbooker's Grab Box! Need a little perk-me-up? Breath some fresh air into your crafting with a Surprise Goodie Box from Song of My Heart, especially for scrapbookers! Containing a minimum of $50 worth of 12x12 papers, full-size sample pages from my classes, Project Life journaling cards, embellishments and other fun products*, these limited-edition grab bags are just $25 each plus $10 shipping anywhere in the United States. I guarantee your satisfaction with the amazing assembly of goodies inside each bag! Never had an unhappy grab bag customer yet. PayPal $35 total to Lyssa@songofmyheartstampers.com with the words "Scrapper's Surprise Box" in the subject line, and your box will arrive on your doorstep the first week in October! Offer ends Sept 30th, 2016 and is only available in the United States. *please note all Stampin' Up product is retired, in order to comply with sales policies. If you have any questions or would like to order current merchandise, please feel free to contact me directly at Lyssa@songofmyheartstampers.com and I'll be happy to help you with that! 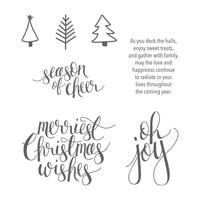 BONUS: a free 200+ page Stampin' Up main catalog AND the new 50+ page 2016 Holiday Mini Catalog will be included at no extra charge, if you don't already have them! What will be in YOUR bag? Let's find out! Hooray for September first! We can all finally dig into the 2016 Holiday Catalog with abandon. I'm going to be sharing honest product reviews with lots of pictures and any tips I learned along the way, so YOU can make the best choices for your crafting buck! The first thing I wanted to tackle as a personal project was the new Tin of Tags gift set. I've fallen in love with our line of tins for card organization, so I couldn't wait to see what a "tin of tags" might be. I was not disappointed! First off--they were easy (whew!) Everything was already die-cut for me; all I had to do was stamp the pieces and then layer them together using (or not using) the full-color, close-up pictures in the instruction booklet. The hardest thing I had to do was glue those little sequins down. LOL! But they went pretty easily with the Fine-Tip Glue Pen. Look at the tassels!!! Love them. This kit is the only way to get the red ones; there is an assortment pack of Silver and Black ones in the Halloween section, though. I am snagging some of those to save for graduation season next spring! Secondly, you get a LOT in the kit! There's enough pre-cut tags and layers to make THIRTY tags, three each of ten different designs. So you're not gonna get bored, that's for sure. I made one tag of each kind exactly according to the directions, and then I shot off in my own direction and made the other twenty tags completely randomly. It was fun! Third, it's just about exactly the right amount of time. I'd say that working without interruption (did I mention my whole family is back to school?) I got the entire kit done, surface tidied up and everything packaged back up in the cute little polka-dot tin in about 1.5 hours. So it's perfect if you want to get a project done in one sitting, which is pretty much what modern crafters can spare, these days! If you're making the tins full of tags to give as gifts, you could do them assembly-line style and probably whittle that time down to an hour, hour-and-ten or so per tin. Not too shabby for a quick, handmade Christmas gift for teachers, coworkers, neighbors and friends. The stamp set is not included in this kit. That's designed so that you can get "refills" of the tags without having to pay for a second, third, fourth stamp set every time. So it's actually a big plus! You can buy the suggested set, Tin of Tags (wonder how long it took them to come up with THAT name?!) or you can just use any Christmas saying set you have on hand. I bought the matching one because I love the big snowflake. If you do buy the coordinating Tin of Tags stamp set, you can use some of the generic non-holiday stamps on tags year-round. Bonus! Keep an eye on the amount of twine you're using. I was just cutting it off as I went but I only had a couple of inches left by the time I got to the final tag, so you might want to measure and divide up the seven yards in advance just in case. When they say the wooden snowflake embellishments are fragile, they mean it. Thankfully, the banner covers any busted spots. I'm just sharing this for a friend, of course (ahem). You can get by with less than the suggested number of colors of ink. If you have to, you can skip the Old Olive and Crushed Curry and just use Real Red and Island Indigo or any other deep blue. There you go! I hope you've enjoyed my product review of this hot-off-the-press new Tin of Tags kit from Stampin' Up. If you're excited to order it for yourself or as gifts, let's go shop with Lyssa right now! Thanks for stopping by Song of My Heart today! Check out more product reviews all this month as we dive into the fall and winter season with abandon! The best $20 you'll spend all summer! Want some real bang for your crafting buck? How about Buy One Get One Free? That's right, Stampin' Up is having a FANTASTIC special where you purchase your first month of Paper Pumpkin and get your second month FREE! Sign up at bit.ly/paperpumpkins, choosing me as your demonstrator, and use "BOGO" for the promo code. A fun crafting escape in a box will arrive at your doorstep once a month! I've been a subscriber since day one, and they just keep getting better and more creative. Each month comes with an EXCLUSIVE STAMP SET you can't get anywhere else, too--that alone is worth the price! Offer is good for new subscribers from now through October 10th. Sign up by the tenth of the month to get that month's kit; otherwise, your subscription begins the following month. Kits ship on the 15th of each month and there's a booklet included in the box--AND a video posted on Stampin' Up YouTube so you can see it being assembled. Make this great little display piece with interchangeable signs you can switch around for the seasons! It's perfect for the office or that little spot at home that just needs something. You won't believe how easy this kit makes it! In two hours of crafty fun, we'll have an adorable, sturdy chalkboard easel you will use for years to come. I'll provide the snacks, stamps and ink--you just come and enjoy yourself! Not local or can't attend? 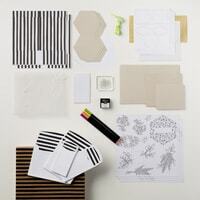 Make this kit at home with the addition of the coordinating Enjoy the Little Things stamp set. In fact, if you purchase the kit, the matching stamp set, and a Fine-Tip Glue Pen, you'll qualify for a free Sale A Bration reward choice, too! Or, get together with a friend to make the kits using stamp sets you already own--but pool your order online, and get a pack of Sale A Bration papers to split, totally free. Email me if you'd like help placing your order, or click here to go shop. Check out all the display pieces we'll be making at the class... I did these all myself. I felt so accomplished when I had it all put together and this big stack of cute things to clip on! Ever wondered if one of those all-inclusive craft kits really WAS all-inclusive? And if a kit could ever really satisfy your sense of creativity? Wonder no longer! 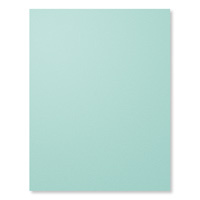 In our first ever product-review, I'll walk you through the Watercolor Wishes card kit (http://bit.ly/1V2OTFy) start to finish so you can make smart choices with your crafting bucks. Got a product you'd like reviewed? Email Lyssa@songofmyheartstampers.com with suggestions!